NOTE: I used Lenovo IdeaPad S10-2 as a test machine in this post but this will also work to any laptop/netbook/pc that can recognize USB devices as a boot option. This also works if you want to use Windows Vista. 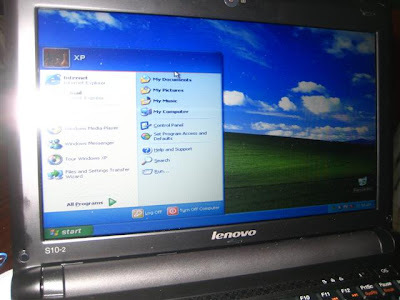 The owner of this Lenovo S10-2 tried to upgrade his operating system to Windows Vista. The problem is he had some problem while installing it and his machine refused to load the OS. He also accidentally deleted the recovery partition, so the one-key recovery won't work to restore to factory default. The owner now wanted to install Windows XP instead of Vista. I usually use my external DVD Rom drive for this kind of work (it's the easier than USB method) but it broke down a couple of days ago. So I have no other choice but to install from a flash drive). Fortunately, installing from a USB drive is now easier than it used to be. There are programs out there that handle all the work for you. Unlike before that you need to fire up command prompt and issue some commands to prepare the flash drive/usb drive before it can be use to install Windows XP. That's the reason why I prefer installing from external DVD ROM drive before. 3. Windows XP installer CD or a copy to your hard drive. Steps on installing Windows Xp from Flash Drive:1. Prepare your flash drive. Run WinToFlash.exe and choose the wizard. This one is self explanatory. Windows files path would be your Windows CD and USB drive is your flash disk. Next window will be copying the setup files to your flash drive. In took about 30 minutes in my test using a 2 GB KingMax flash drive (I believe this result may vary depending on the speed of your source and your USB drive). 2. Turn on your laptop. Enter BIOS by pressing F2. Make sure that SATA Controller Mode is set to Compatible under Configuration. If you do not do this, the windows installer will not see your hard disk upon setup. Now Save and Exit. 4. This window will appear. Select 1st, text mode setup (boot from flash again after finish) here. You will now see the usual setup process when you install windows from CD. If that happens, just restart your laptop and choose to boot from flash drive. Installation of windows finished after 35 minutes in my test. It may vary depending on the speed of your laptop and your USB drive. pwede ba yung FAT32 lng o NTFS pa? ahehe what about pag lennovo mini note book aun... panu po un.to install xp?without external cd/dvd rom.thnx. The steps here working. I tried it and able to install from my micro sd card reader with 2gb micro sd card. I don't think na gagana to sa lahat, like in my case. It doesn't work, because it always tries to install sa drive W: which is yung USB with Windows Setup. So no use yung software sa akin. But I hope iba ang result sa others. it's ok to mount the Winxp.iso installer??? ito bang unit mo ay merong CD-rom drive????? now punta ka comp shop with ur MagicISO intaller and WinXP cd to make an ISO file together w/ur flash drive. pa-install mo s comp nila MagicISO.exe then save it from ur USB drive at uwi kna at cut/paste mo sa comp mo yung pinagawa mong ISO file. sa mga nagkakaproblema na yung usb drive lang ang nakikita, SATA kasi yung drive na nakalagay sa inyo and SATA din yung naka-set sa BIOS. by default, walang SATA drivers na ini-install ang XP (sa pag start pa lang ng installation, humihingi na yun ng RAID or SATA drivers). pwede nyo embed yung SATA drivers using nLite, or try nyo set to IDE or compatibility mode yung hard drive nyo sa BIOS. HELPPP!!! ANO BA ITO? YUNG NAG BOOT NA SA USB BAKIT ANG TAGAL? GANITO BA TALAGA ANG BOOTING PROGRESS ? ng ibang working computer na may XP, tapos icopy niyo sa same directory (40\bin) nung netbook na gusto niyong lagyan ng Office. Also, for MSI netbook users (particularly Wind U130), eto ang solusyon sa 'di makitang hard drive. eve tried it in my brothers gf acer aspire 1 notebook. it work thanks! Im getting the error windows/root/system32/hal.dll. tried boting from USB but it didnt work. May bagong MSI netbook ako at walang OS. 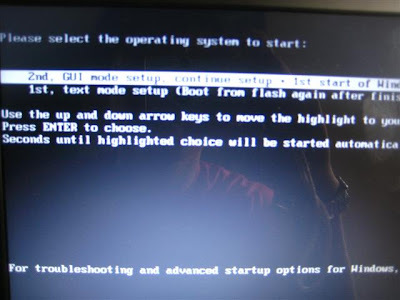 Ngayun meron akong flash drive na bootable gumagana naman sya sa LAPTOP kop ng HP 6510b kaso sa netbook hindi. Bakit kaya? Sinundan ko lang ung steps jan. Kaya lang dun sa first step plang e black screen lang nakikita ko? Any idea why? Thanks! bakit sakin blue screen nalabas? You need to install Windows XP first then Windows 7 to make it work. pang laptop at notebook lan ba yan boot na yan?? 1. Use Novicorp WinToFlash application to create "bootable usb" (it is recommended to use wizard). 2. Set SATA Controller Mode to Compatible or IDE. 3. 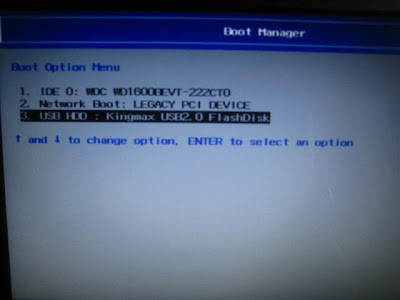 Boot using bootable usb. 4. Select "1st, text mode setup (boot from flash again after finish)"
6. After reset, shutdown and edit "Boot.ini in "bootable usb" in another PC. 7. Look for "multi(0)disk(0)rdisk(1)partition(1)" and replace it with "multi(0)disk(0)rdisk(1)partition("x")", where "x" is the partition number where you installed Windows. 8. Boot again using bootable usb. 9. Select "2nd, GUI mode setup". 10. Continue and finish installation of windows. 12. 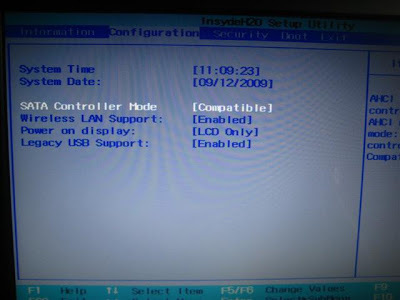 Remove "bootable usb" and restart PC. is it possible to work on msi u230? pwd din b 2 sa desktop? NOT Working.. I'm done with the copying of file which will restart the system for the first time but after selecting the '2nd, GUI mode setup,continue setup + 1st start of windows', it always gives error: "\system32.\hal.dll. please re-install a copy of the above file. regarding this comment from above : "multi(0)disk(0)rdisk(1)partition(1)" and replace it with "multi(0)disk(0)rdisk(1)partition("x")", where "x" is the partition number where you installed Windows. also for those whom keeps getting Blue Screen errors after selecting the 2nd GUI option, try first the above and then lso try to lower the Bios video setting or better, set bios Defaults then restart and proceed. applicable ba ang steps na ito sa samsung np305u1a-a03? thanks! kung windows 7 ang gusto mong iinstall na OS sa USB wag yang wintoflash ang gamitin mo. mas maganda at epektibo kung ang gagamitin mo ay Universal USB Installer mula sa linuxpendrive. hindi sya pwede sa XP, pwede lang sya sa Vista, 7, 8 at ibat ibang mga linux OS..
sa windows 7, its so easy. - just format the usb drive(4gb requiment) to ntfs. - open the drive where the iso image is loaded, unhidden all files, copy all and paste it on your usb stick. - that's it.. so easy..
Magagamit pa ba ylit yung USB?